To my surprise, not a great deal! The yarn isn’t very slippery so the stitches stayed put until I picked one set of them up with a needle to knit on and slipped the other set of them on to a life line. Unfortunately, when I embarked on the short rows, I was talking to my Dad at the time and wasn’t paying attention. For some unknown reason I placed my wraps and turns only a stitch apart. When I finally made it as far as grafting the two bits together, I realised that I had created what can only be described as a giant TOE coming out of the back. 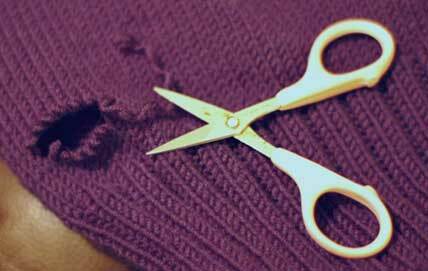 Quickly, I ungrafted and replaced all stitches the way they were. On further contemplation, three wrapped stitches each side about an inch apart will probably give the desired effect (finished jumper, relieved knitter, warmer father). I got thoroughly carried away with my sleeve the other day. It happens so rarely I thought I should run with it! This is definitely the snuggliest item I have ever knit and I can’t wait to get it finished. I’m off to the Knitting and Stitching Show tomorrow. I’m going bright and early and getting out of there before lunchtime (I know it’s a luxury to be able to take off to such things when everyone else is doing their 9-5 thing but I pay for it in a million other ways). If you see me there, say hello. I’ll be wearing a luminous green mohair cardigan (you’ve been warned… bring sunglasses). Shopping list? Definitely a swift. The last time I tried to wind a skein, it resulted in a two-day trauma of knots and a very cranky knitter. I also want to see the exhibitions put on by the various design colleges as they’re usually really good. I’ll probably end up haranguing some poor representative from at least one of these colleges for not having a proper knitwear design course to offer in Ireland. Vendetta? Moi? I have either learned how to knit in my sleep or the elves have been helping me again. I suspect the latter. I tried it on last night before I joined the body in the round and separated off the sleeves. I was expecting it to fit so that wasn’t a big surprise… but the shape of the neck was. Obviously because I didn’t work a ribbed border around the neckline, I was going to end up with the square raglan neckline. I knew that. I just wasn’t expecting it to be something that I really liked the look of! The angora hem makes it so snuggly. Sleeves are up next because I can never face them when I’ve finished the body. 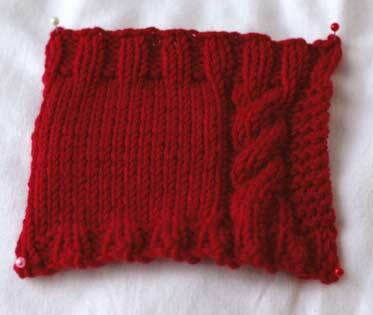 While the elves were at work, I got some swatching done for the aran jacket I mentioned. Since the idea first struck, I have been quite decided on using a Saxon braid as the zip placket. When I first worked this up, I hated it. It was too loose to be a placket, it would lose shape and be floppy. I left it down and went looking for a different braid to use. I came up with this one. I think it’s called a five-plait braid. I knitted this on to the end of the Saxon braid. When I was finished, I cast off the entire thing and left it down for a while on the chair. I returned later to find that both cables had ‘settled’ and were far denser than I initially thought. And, when observed from the distance, the Saxon braid was much more striking than the five plait braid. Saxon braid it is! I may use the other one as an edging on the cuffs, since it looks fairly similar but isn’t as busy as the Saxon braid. 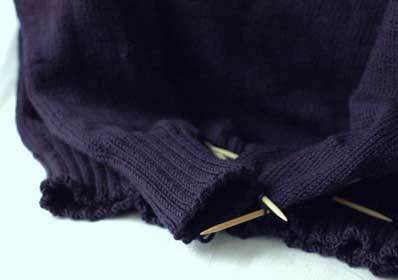 I found a solution to the collar for my dad’s jumper: I won’t make a mitred corner at the V-neck, I will knit it back and forth and lay the front left bit over the front right and sew them down. A little bulky perhaps but better than a really crappy mitred corner. 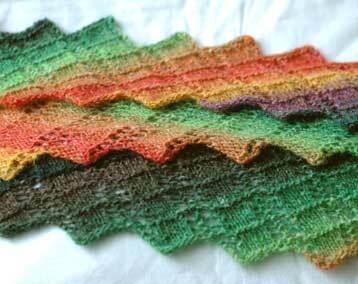 Then there is the issue of the short rows for the back. I can’t face ripping out 4 inches of ribbing at 280 stitches per row. Nor can I face taking out the stupid sewn cast off. 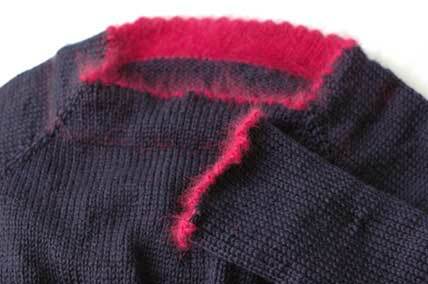 I think I’ll cut a hole above the ribbing, pick up the stitches, knit in the extra wedge, and graft to the bottom edge of the hole (this idea may have been the elves’ doing). It’s been an eventful week and I am glad it is over. Yesterday evening I treated myself to some time under the blanket making something I have been dreaming of for well over a year. The stuff? Louisa Harding’s Pure Angora and Debbie Bliss’s Cashmerino DK. I started off with a provisional cast on and an inch and a half below my intended neckline. 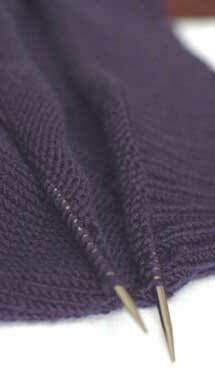 Knitting with the angora, I decreased at the raglan points until I reached the number of stitches for my neckline. 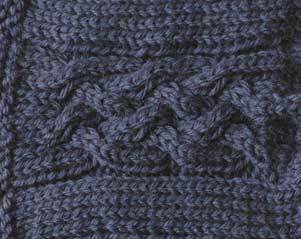 Worked the picot edging, joined in the navy cashmerino and started my top down raglan properly. 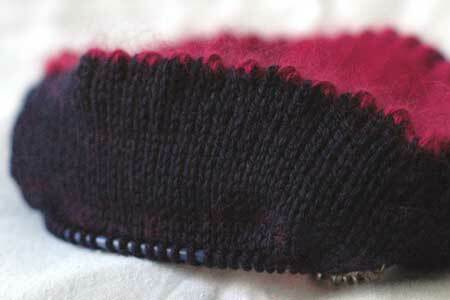 When the cashmerino bit matched the angora hem in length, I joined them together and continued knitting. I can’t wait to get to the other hems! I got stuck into some other swatching I’ve been meaning to do for the last week as well. 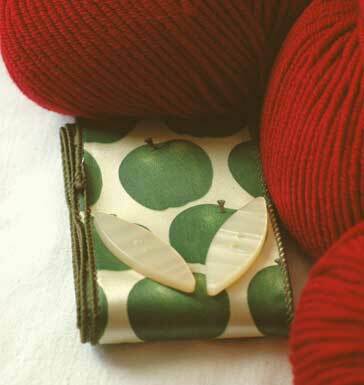 This is an idea of what I’m planning for the cardigan with the apples ribbon. I’m dying to get this underway, too. I have two other projects in mind as well. One is a black Christmas top edged with black lace and the other is a snuggly aran zip-up jacket for my mum (with a furry zip-up collar!). If I can get all four of these knitted by Christmas I’ll be really happy. I want to write patterns for them all. What else? Oh yes! Hung out for a while at This is Knit yesterday afternoon. I donated some socks for their display at the Knitting & Stitching Show next week and showed off my new hat (wearing it still, by the way. It goes well with my dressing gown). I picked up some extra Rialto Aran for the red cardigan above, some sock yarn… and Summer Tweed to make Alb something for Christmas. In other news, I have been having very strange dreams lately. Can the equinox influence dreams? On the first night, I met Stephanie Pearl-McPhee. We got on like a house on fire and I woke up in great form. The next night, I threw a party and Fiona Ellis was there. This surprised me greatly – even in the dream – because I didn’t know what Fiona Ellis looked like. I gave her a big hug and walked through a fire place into another room. Last night, I dreamt invisible aliens were taking over the world, eliminating human beings one by one all the while observing our behaviour and rituals. At one point, I poured blue paint all over Alb. I really preferred the famous knitters dreams. Argosy was still blocking when my sister flew back to the States on Tuesday. A pity she couldn’t take it with her; Tuesday, after all, was her birthday. But it’s an ill wind because I was able to get some snaps of it before I stick it in the post today. When I was knitting it, the fabric curled up like there was no tomorrow. The magic of blocking lives on! I got the stitches all picked up for the collar of the navy jumper… and that was as far as I got. I soon realised that I would need a plan of action to shape the V-neck properly. Work took over for a few days so I’m looking forward to sitting down with it later today and sorting it out. I can’t wait to get the jumper done. It is overdue and I am ready to move on to something else. 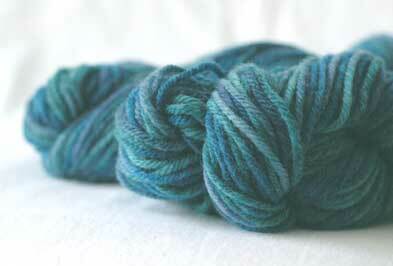 I originally intended to use my recent purchase of blue faced leicester to knit the tam pattern from Knitting Nature. After thinking it over, I decided that the yarn and pattern wouldn’t do each other justice. Since I was all fired up to knit a hat, I reached for my trusty Knitter’s Almanac and EZ’s bevy of hats for the month of June. Having already knitted the Ganomy hat and wanting to keep the Three-cornered Tam for Talk Like a Pirate Day, I decided on the Maltese Fisherman’s Hat. I’m not familiar with the fashions of Maltese fishermen… to me it looks more like a Viking hat. Isn’t it unusual? I imagine it’s what all the hip Vikings wore under their helmets. 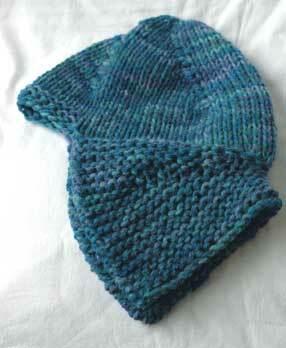 The short-row shaping around the back of the head makes the hat hug your ears and neck. 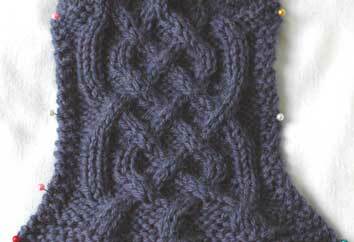 The garter stitch band is echoed in the decreases for the crown, which are worked as a purl-2-together. EZ calls for the hat to be worked into a very pointy crown. I did that initially but it looked ridiculous. I ripped it back and kept the crown fairly flat. The hat is a little shallower than I usually wear because of this, but only by a row or two, and I much prefer a slightly shorter hat than a pointy hat. I worked the Blue Faced Leicester two strands held together on 8mm needles. I think I’ll make another! I made this one in about two hours. In other news, things are beginning to settle down and go more according to plan. I’ve got a break in teaching because of Hallowe’en – not my choice – and only realised yesterday that I won’t be working next week. This, of course, leaves me free to go to the Knitting and Stitching Show. Muahahahah! The ultimate test of willpower! Actually, I wouldn’t mind looking for a swift (I live alone and have tried everything. I’m at the end of my tether). But will I re-emerge financially intact?? Surprise, surprise. The jumper wasn’t finished for Saturday. This is entirely the fault of the ridiculous sleeve. I had to rip half of it out to correct my decreasing error. I got the sleeve finished on Saturday morning so instead of pretending I didn’t have a present for him, I got him to try it on instead. Not quite what I had intended, but better than nothing! The second sleeve is about an hour away from the finish line. It fits him really well (thank God). The yoke is snugger than I intended but it’s fine. The sleeve was a perfect length. The front was also a perfect length. The back? About two inches too short. I now understand why EZ encouraged short rows at the lower back! Every time I read this, I always thought to myself, yeah, ok, maybe if the guy has enormous shoulders. But looking at it on my dad, I now realise that all men, not being proportioned like women, are freaks of nature and short rows should be incorporated to compensate for such abnormalities. It is baffling because they seem normal to look at. Where does the extra back space come from?! (EZ was very kind. I don’t think I could resist the temptation to put a huge warning sign over mens’ knits saying: they don’t look it but all men are secret hunchbacks and knitting for them will always require more knitting than you anticipated and far, far more yarn). Sigh. I have two options. 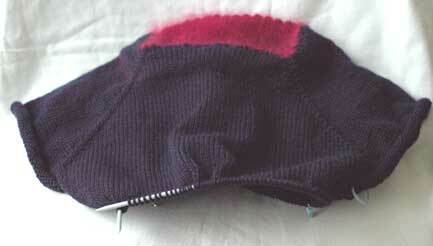 I can rip out my four inch ribbing on the body, stick in a wedge of short rows and reknit the ribbing. Or I can rip out about half of the ribbing, stick in some short rows in the ribbing (is this even possible without looking crummy?) and finish it off quicker. 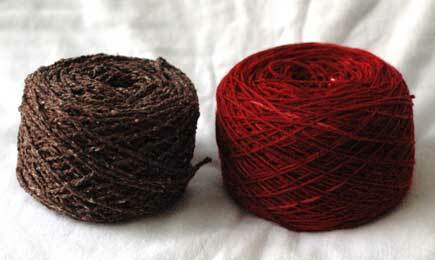 Either way, I am going to have to unpick the 250 stitches of my sewn cast off. Every single one. I am never using this cast off again for a sweater (note to self: not every idea is a good one so resist the temptation to run, nay, sprint, with each one). On the upside, Argosy is blocking on the carpet beside me. It says hello. Its completion came as a total surprise because I had abandoned it in favour of the jumper. I pulled it out yesterday to show to my sister, realised that I had very little yarn left and ought to finish it off. That I did, and all being well it will be winging its way back to America with her tomorrow as her birthday present.